I love those bunny earmuffs. they are so cute! She looks really cute in this fashion! OMG, she is ridiculously cute! Or should I say kawaii . I like the color that you used for the outline, I can never seem to get that to work well in my drawings. And the rabbit earmuffs!!!! Aw, she is so adorable and cute! 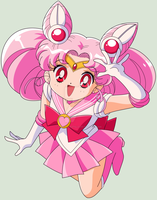 I really like this picture especially since it has Chibiusa.